Just because we show up to work doesn’t mean we work the full day. We all have inefficiencies. There are distractions. There are interruptions that take our focus off the task at hand. In science, there are no methods of work that are 100% effective. The second law of thermodynamics which deals with disorder and efficiency shows there is always some amount of energy unavailable to do work (i.e. entropy). If we are truly honest with ourselves, we must admit we are incapable of being 100% effective at our jobs. Using our mental model as a basis of generating emotional feedback, we convince ourselves we work at 100%. We may give 100% of our attention for a given amount of time, but we definitely do not work at 100% effectiveness. I’ve even hear occasionally, people stating they give 110% or managers asking for more. I suspect they would admit that giving more than 100% effort is impossible, but who knows. Our capability of doing work is directly related to our attention, attitude and actions. Out of these three personally managed assets, we product our self-control and awareness as well as our situation awareness and acceptance. When we took the job we have, we essentially created a contract to do what needs to be done as required by the system employing us. The return for our investment of time and attention is the steady income we survive with and seek the pleasures we do. Our attitude on the job directly affects the amount of action we take to produce any sort of result. Whether we want or don’t want to do something, our actions follow suit. We think this may not be noticed in this moment or the next. However, our actions over time create patterns and trends which are noticed. We may convince ourselves our job is secure or insecure based on our actions but the fact is, none of us really know. We are part of a system that produces some desired product or service. Our interactions and interdependencies we foster are what ultimately determine our level of security in any given position. Within our jobs, when we find ourselves not wanting to do something and take actions in accordance with that desire to do something else, we short change ourselves in the long run. In the short-term our actions doing something other than what is expected may have some benefit for us or even for the organization we work for. However, repeated action not fully aligning with the expectations of the system we are employed by reduces our overall effectiveness and worth to the organization. In the long run this undermines the stability of our position. Relative to managing the business of you, when we find ourselves not wanting to do something on the job, we need to ask what’s more important? Is our short-term satisfaction in doing what we want more important than the long-term stability of our position? Is what I’m doing now supportive of my business in the long-term? Another approach is to ask yourself, why don’t I want to do what’s expected? How can I align what I want with what’s expected of me? This latter approach moves us out of the mode of doing what we are told into sharing our vision with the vision of the system. When we want to do what’s expected, our effectiveness and efficiency are not a concern. They naturally increase without our conscious direction. Our efficiency increases despite the distractions and interruptions that occur everyday we go to work. We may not be able to be 100% effective or efficient, but when we want to do what we do, we are as effective and efficient as we are capable. In light of managing the business of you, we have to be honest with ourselves. 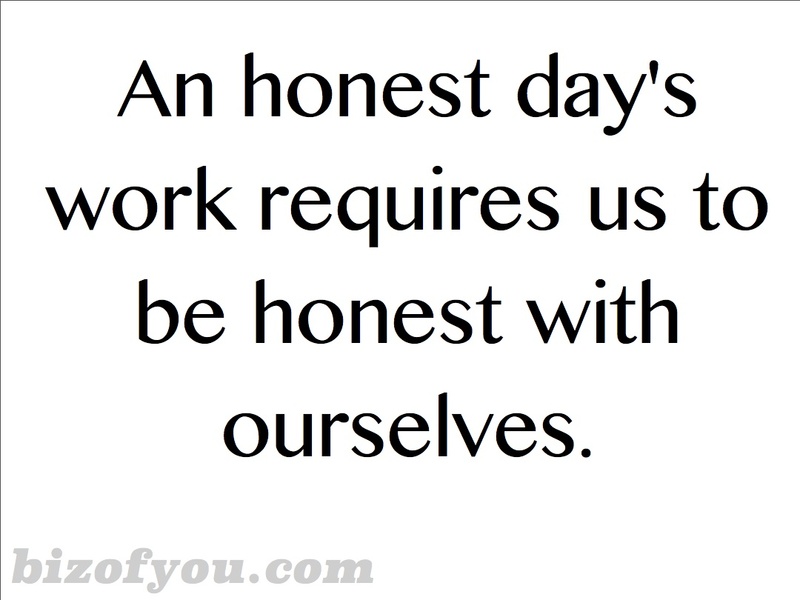 This leads to putting in an honest day’s work. When we want to work, we work effectively and efficiently.